The No. 8 Nebraska volleyball celebrated its 250th consecutive regular-season sellout in a big way with a thrilling 3-2 win over No. 7 Penn State in front of a crowd of 8,434 on Friday night at the Bob Devaney Sports Center. The Huskers (17-6, 8-5 Big Ten) beat a top-10 opponent for the first time in their last six tries after a dominant 15-8 win in the decisive fifth set. Penn State held the upperhand in the match after a 27-25 comeback win in set one and a 25-21 win in set three after the Huskers took set two, 25-19. 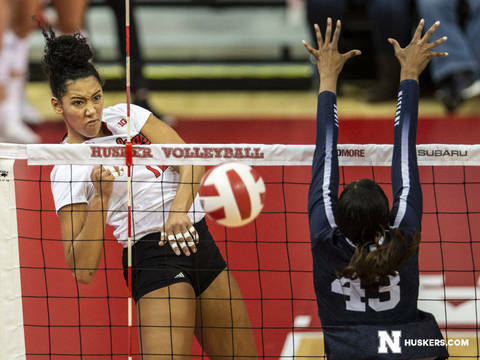 Needing to win the fourth set to force a game five for the third straight time in the series, the Huskers did so with a 25-18 win. In set five, Lexi Sun, who had a match-high 16 kills, came up with six kills on nine swings to spark the Huskers past the Nittany Lions (18-5, 9-4 Big Ten) for NU’s eighth win in the last nine meetings between the teams. Set 1: The teams combined for three early service errors as Penn State took a 6-3 lead. The Huskers pulled within one point twice, but Penn State remained in the lead and went up 12-8 after a Husker hitting error. Sweet and Stivrins connected on back-to-back kills and then stuffed a Penn State attack to pull the Huskers within one for a third time, 12-11. This time, a Penn State net violation leveled the score at 12-12 for the first time since it was 1-1. A tough serve by Maloney then created an opportunity for Foecke to smash a kill on an overpass to give the Huskers their first lead, 13-12, after the 5-0 run. Foecke and Stivrins combined for a block to put NU up 15-14 at the media timeout, and Nebraska went up 18-15 after a block by Schwarzenbach and Sun and a kill by Sun. A crazy rally that began with Maloney diving into the Huskers’ bench to save a ball resulted in a solo block by Schwarzenbach for a 20-16 Husker lead. After seven consecutive sideouts, Penn State pulled within 23-21 on a kill by Hord. After a timeout, Stivrins terminated to earn set point for the Big Red at 24-21, but the Nittany Lions answered with the next three points to tie the set at 24-24. Penn State gained set point at 26-25 after a Husker hitting error, and the Nittany Lions won 27-25 after the Huskers’ seventh attacking miscue of the set. Set 5: For the third straight time, Nebraska and Penn State played a fifth set. Penn State held the early advantage after taking a 3-1 lead. But Foecke pounded a kill and solo blocked a Penn State attack to tie the score at 3-3. Foecke, Sun and Stivrins boosted the Huskers to an 8-5 lead with a trio of kills. Back-to-back-to-back kills by Sun and a Penn State hitting error increased the Huskers’ lead to 12-6. A Penn State couldn’t slow the Huskers’ run, as Schwarzenbach and Sun combined for a block to make it 13-6, and Stivrins served NU’s first ace of the match for match point. NU won 15-8, finishing the match on an 11-3 run. Nebraska outlasted Penn State (18-5, 9-4) in a season-long 2 hours, 55 minutes, besting the previous match against the Nittany Lions by 2 minutes.